Women on a Mission: Mom Edition: I Love My Land's End - Kids Sale Thru Tomorow FYI! I Love My Land's End - Kids Sale Thru Tomorow FYI! Well, Friends, Land’s End has been killing it once again! I think I say this every fall (when I have to buy new stuff for the kids and am usually on the lookout for a piece or two for myself) but they cannot be beaten! Land’s End quality is outstanding, their style is trending and flattering (unlike the Forever 21 harem pants I saw when I was hunting for skinnies the other day) – and their prices are always great. I am not being paid for this, I just wanted to tell y’all what I found. 1 – Dresses – I’m looking for a few winter-appropriate dresses. Maybe for work, maybe for events. I found two, on sale. I tried them on and they look great – a $90 dress for $20!! When I wear them, I’ll put up pictures for you to see. 2 – Work Pants – I like to wear pants to work in the winter. I live in Minnesota. It’s a no-brainer. I’ve read about their Ponte-Knit work pants for ages, but never purchased them as they’re usually in the $50-60 range and so I put them on the ‘next time’ list. Well, I found a pair on sale for $30 and I was in need of a pair of pants. Let me tell you that these feel like I’m wearing sweats to work!! Note: the reviews said they shrink easily, so I called LE Customer Service and they said to wash cold and hang dry and that should avoid this problem. 3 – Necklace – I don’t normally consider Land’s End a jewelry place, though they’ve always had nice accessory jewelry available. I found a necklace I just had to try, though, so I did, with my birthday money. I haven’t gotten it yet. 4 – Kid Clothes – Their kids’ clothes aren’t the cheapest, not the most expensive, but I buy a lot of clothes locally and for the girls’ school pictures, I wanted their outfits to be from someplace else besides one of the standard stores I shop at (Target, Children’s Place, Gap Kids, Old Navy) – for ease as much as anything. I got the girls dresses and since it was the same dress, just different pattern, I was able to take advantage of their buy-2-(or more)-and-get-$3-off-each-dress sale. 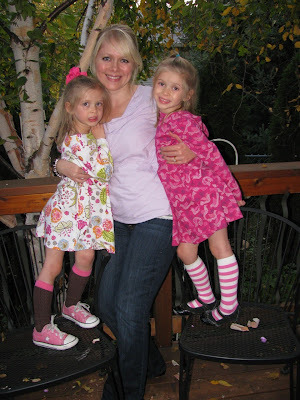 These are Land's End dresses and socks the girls wore for their 5th b-days last year; new patterns this year. 5 – Kids’ Outerwear – Land’s End kids outerwear can’t be beaten by a mile. Dad and Mom Connie got the girls LE Squall Parkas last year and they’ll wear them again this year because the sleeve length extends (genius). We got the girls their snow boots from LE last year and they were great, waterproof and easy on-off. They outgrew them, so I had to order new pairs – same style since I know what works! I also ordered another set of their fleece mittens and hats since I know it’s good quality, not chintzy stuff. Why am I stocking up on this, you say? Because through September 17th at midnight Central time, kids outwear is 25% off with this code and pin # (PLAYFUL; 3120)!! Those are from my catalog – I don’t know if you can find it online anymore since their website seems to have moved on to another sale. You’re welcome. Have fun shopping! I’m always happy to share tips where I find them since it seems like the internet is a snake pit for the unwitting shopper what with restocking fees and return deadlines. Yowza.